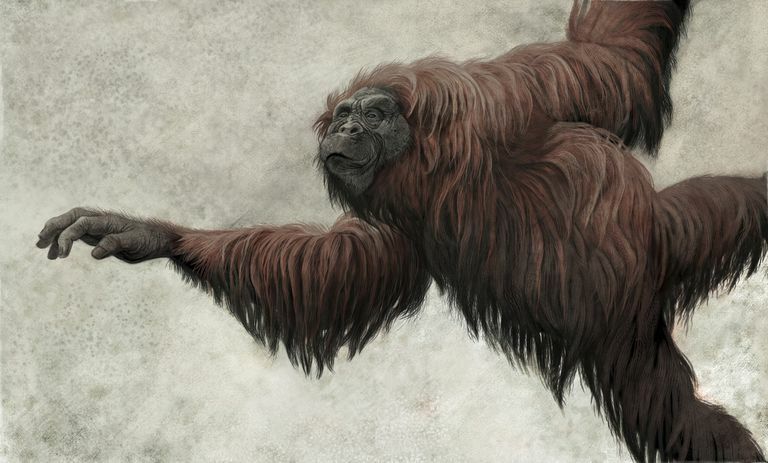 One of the many prehistoric primates of the Miocene epoch (a close contemporary was Pliopithecus), Dryopithecus was a tree-dwelling ape that originated in eastern Africa about 15 million years ago and then (like its hominid descendants millions of years later) radiated out into Europe and Asia. Dryopithecus was only remotely related to modern humans; this ancient ape had chimpanzee-like limbs and facial features, and it probably alternated between walking on its knuckles and running on its hind legs (especially when it was being chased by predators). On the whole, though, Dryopithecus probably spent most of its time high up in trees, subsisting on fruit (a diet we can infer from its relatively weak cheek teeth, which wouldn't have been able to handle tougher vegetation). The oddest fact about Dryopithecus, and one that has generated much confusion, is that this primate lived mostly in western Europe rather than Africa. Today, Europe isn't exactly known for its monkeys and apes — the only indigenous species is the Barbary macaque, which is barely European, confined as it is to the coast of southern Spain, where it has penetrated from its usual habitat in northern Africa. It's possible, though far from proven, that the true crucible of primate evolution during the later Cenozoic Era was Europe rather than Africa, and that after the diversification of monkeys and apes these primates migrated from Europe and populated (or repopulated) the continents for which they're best known today, Africa, Asia, and South America.